WAIKIKI BEACH VACATION CONDOS. . . JUST STEPS TO THE SAND! Your own Oasis in Paradise awaits at the Beautiful Imperial of Waikiki . 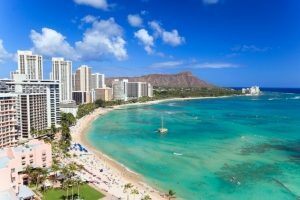 . . Just Steps to the Sparkling Sands of World-Famous Waikiki Beach. You’ll marvel at another Breathtaking Sunset from the Private Lanai of your own Newly appointed Studio, 1-Bedroom or 2-Bedroom Oahu Condo Vacation Rental, while enjoying our Grand Boutique-flavored ambience and Full-Service Amenities. The excitement and beauty of Paradise will then beckon your call just steps outside your door, showcasing the finest selection of shops, dining and World-Class Entertainment. Incredible Views await your Pleasure from our Roof-Top Sun-Deck — Complete with Pool and Jacuzzi – Featuring all of Waikiki, Diamond Head and the Sparkling Blue Pacific. Additional Property Amenities showcase 24-hour check-in, Daily Maid Service, Bell service, Valet Parking, on-site restaurant and Activity Desk. 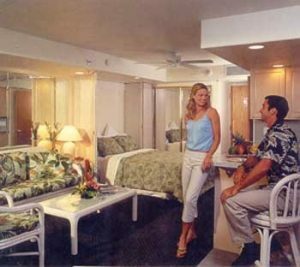 Your Vacation Condo, decorated in a tropical-rattan motif, features large Lanais, fully equipped kitchens or kitchenettes, TV/VCR and in-room safes. Welcome home to the Beautiful Imperial of Waikiki . . . 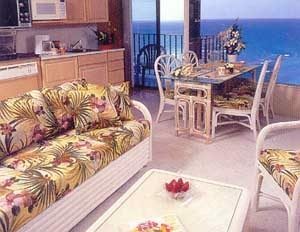 The Ideal Waikiki Beach Vacation Condo Rental Getaway locale . . . Just Steps to the Sand!. Your Waikiki Beach Vacation Condo Rental Features your Choice of either Studio Suites Simply Ideal for 2 guests; 1-Bedroom/1 Bath Oahu Condos with Mini-Kitchens that sleep 4 People; 1-Bedroom/2 Bath Waikiki Condos that accommodate 5 people; And Spacious 2-Bedroom/2-Bath Oahu Condo Rentals Showcasing 2 Private Lanais That Sleep up to 6 Guests. All Linens/Towels provided.